An unexpected inter-species art collaboration initiated by an urban Common Frog [Rana temporaria]. ‘Petal in the Pond’ – Photo by CiCi Blumstein 2015. Cool Calm by the Frog. This is ‘Petal’, a Common Frog (Rana temporaria) and one of the regular Brighton Backyard Frogs, chilling out in my micro wildlife pond on a hot day in June 2015. At the beginning of December 2012, just before a bitter cold snap, a small and exhausted common frog [Rana temporaria] hopped into my life. He was a lucky frog indeed: I found him caught in a deep bucket that had half-filled with rainwater in the garden – skinny, struggling and unable to escape. Just a few hours later, and it would have been a choice between drowned or frozen frog, probably both. A recent, rather radical garden clearance, plus building works nearby must have disturbed and left him without a suitable shelter to hibernate. I decided to help him over the winter months by creating a temporary indoor habitat. The best way to catch up with the latest goings-on is via the Lucky Frog’s Twitter croaks at @LuckyFrogLog / #Croakorus / #AgentAmphibian, and see also our posts right here on the Cytomotion blog. Scroll down for the Lucky Frog’s gallery and occasional project updates below. We are featured in the Brighton Digital Festival for the third year running, this time with Croaking Drain, Hidden Frog An Amphibian Thriller: The Frog Forensics Lab – check it out here! 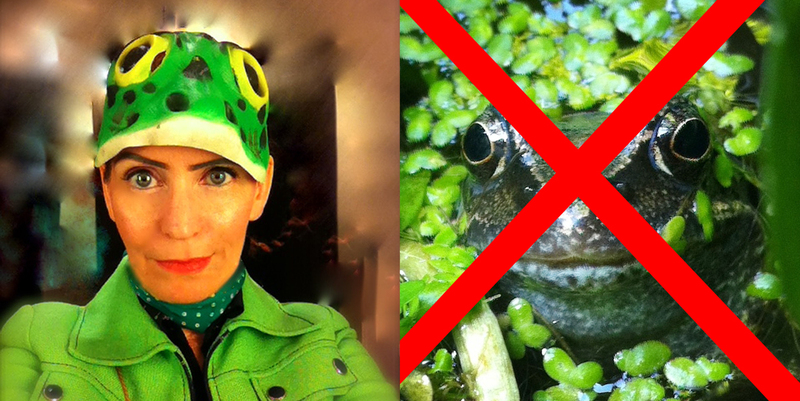 ‘Out in the field’ – CiCi Blumstein aka Agent Amphibian. Portrait by Dean Chalkley 2014. After another year of frantic amphibian activity here at The Lucky Frog Log HQ, CiCi Blumstein & The Lucky Frog proudly present: Croaking Drain, Hidden Frog! Find out more about our brand-new project – running throughout September at Brighton Digital Festival 2014 – here. 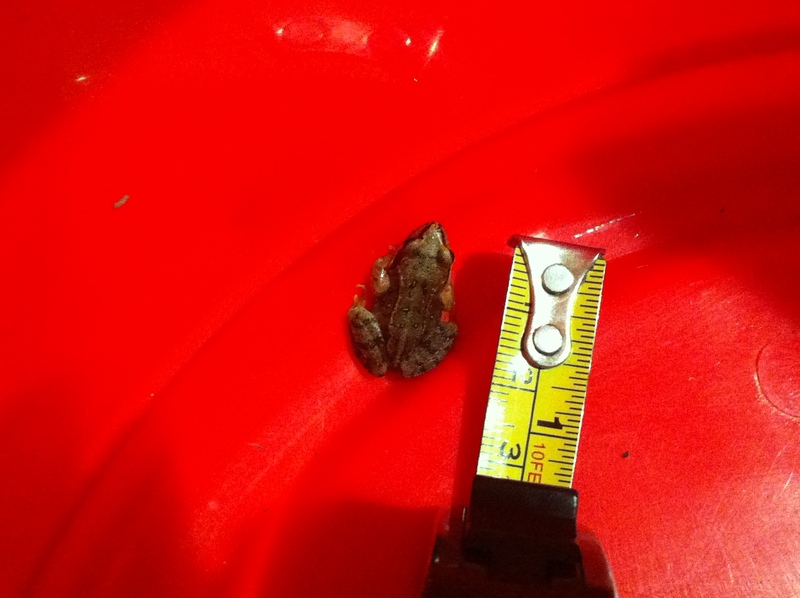 ‘Big Inch’ backyard froglet with tape measure. Photo by CiCi Blumstein 2013. Big beauty by the frog.